Convert RAW file to 16bit TIFF. Tonemap in Photomatix (forgot the particular settings as I did so many shots), Crop & rotate to level horizon, Levels, Curves, Hue-Sat (shift Blue and Cyan to the right, and shift Red and Yellow to the left), Resize, USM. Some folks liked the fill-flash, some folks didn't. The different lightings were a concern, but since it was a Basic editing challenge I couldn't fix it. I took a lot of shots that morning, including some without the fill flash, which are pretty nice as well, but didn't show the ice texture and wouldn't really fit the challenge so well. It was C-H-I-L-L-Y, but at least it wasn't windy. Great light and beautiful color to this photo Slippy. Congratulations on winning the red ribbon! Congratulations on this very well deserved ribbon. Congratulations on the Ribbon!! Awesome image!! Just a surreal image. Congrats! Congrats on the ribbon! Great shot! Great shot Slippy, congrats on the ribbon! Great shot. Congrats. You must love those REDs. Beautiful picture and colors.... well done,congrats..
Congrats on your red ribbon, beautiful photo! Awesome shot. Huge congrats on the red, Slippy. Congrats - now time to brag about having 3 ribbons!! Climbing up the list, Slippy! Tone Mapping is our friend! Congrats! Congrats Slippy. Red is your color! Slippy! I thought I gave this an 11, but turns out it counted as two 1's. ;-) Congrats man! Beautiful shot Slippy, well done. Great textures, colors and composition, Slippy! Big congrats on your new red! Well done mate! Congrats on the ribbon! Very nice timining, the lighting is awesome! 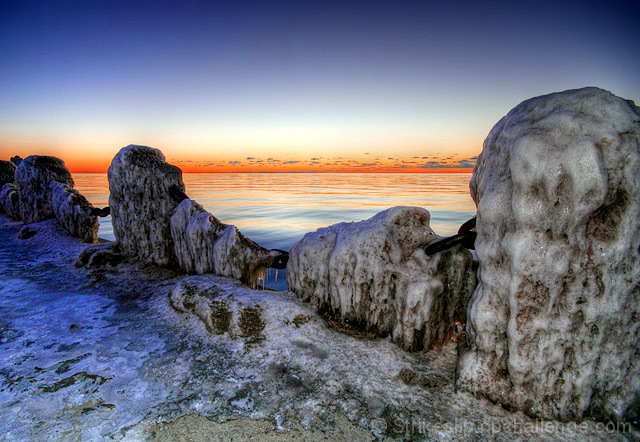 brilliant, brilliant shot, so clear crisp and cold, great colour in the sky and colour in the ice. Colors are great. I'm bothered however, by the ice covered whatever on the right hand side. The lighting is so different from, say, the ones on the left. I don't know if that's how it was lit, or if you used a flash, but it just looks unnatural to me. I love the texture, however, and the look out into the water is beautiful. Great! Love the contrast between the "hot" sky and the ice. Well done. the sunset here is beautiful, but it looks like some kind of fill flash or something on the ice. for whatever reason, the glare on the ice to the right just keeps distracting me. I love this shot. Congrats! Very nice... I like the lighting and focus, and the color capture is quite pleasing to the eye. I love the sunset! Great color contrast. Proudly hosted by Sargasso Networks. Current Server Time: 04/22/2019 04:10:12 PM EDT.